When you’re looking for an SUV that’s perfect for taking out into the wilderness, you want a car that’s reliable, durable, and safe. We know there are a lot of options on the market these days for SUVs, and it can be confusing to research all of the different makes and models. Here, we’ve done some of that work for you by comparing the 2018 Jeep Cherokee to one of its leading competitors, the 2018 Toyota RAV4. One thing is clear: Once you test drive a 2018 Jeep Cherokee, no other SUV can compare. Whether you’re hauling fishing gear to the lake, camping beside the beach, or taking your kids on a cross-country road trip, the 2018 Jeep Cherokee will be there for you. When you’re out in the middle of nowhere, you need a car you can depend on. After all, you don’t want to be stranded in the wilderness with a broken-down car or one that’s run out of gas. No matter— your Cherokee will get 21/30 mpg in the city and on the highway. There are two different, high-powered engines available, the 2.4L Tigershark® MultiAir® 2 engine and the 3.2L Pentastar® V6 engine. These engines will give you a quiet, efficient, and responsive ride, even when you’re on the trails. The 3.2L Pentastar® V6 engine gets a driving range of approximately 474 miles and has up to 271 horsepower and 239 lb.-ft. of torque. The RAV4, on the other hand, needs an added towing package to tow a maximum of 3,500 pounds. Without the towing package, it tows 1,500 pounds. Like the Cherokee, the RAV4 is equipped with all-wheel drive to monitor and distribute the engine power as needed to deliver traction. The 2018 RAV4 comes standard with a 2.5L 4-cylinder DOHC engine that gets 23/30 mpg in the city and on the highway. The RAV4’s fuel economy is a little bit higher than the Jeep Cherokee’s, but it’s comparable enough so that it’s not a huge difference. When it comes to power, the RAV4 only gets 176 horsepower and 172 lb.-ft. of torque. The facts don’t lie; the power and capabilities of the Jeep Cherokee clearly beat out the Toyota RAV4. Not only is the Jeep Cherokee powerful, it’s stylish. The vehicle is designed with aerodynamics in mind, including a curvy rear tailgate and a large rear spoiler. In addition to its signature LED lighting, the Cherokee has advanced daytime running lamps. If you live in areas that get lots of snow and ice, the Cherokee comes ready for that cold weather with heated exterior mirrors and an available wiper defroster. It comes with 17-inch painted, aluminum wheels, silver painted roof rails and is available in up to 10 stylish colors. Whether you want something subtle or vibrant, the Cherokee has what you want. The RAV4 comes in 12 colors, and some models have matching or even contrasting trims in order to make your car stand out from the rest. Like the Cherokee, the RAV also has daytime running lights and LED lights on the front of the vehicle. Finally, each model of the RAV4 comes with a unique and sleek wheel design on the tires. 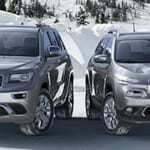 The exterior features of the Cherokee and the RAV4 are pretty much the same, but the Cherokee is the clear winner for those who live or vacation regularly in areas that get freezing weather because of its cold weather capabilities. When you’re out in the wild, you don’t want to sacrifice comfort. Depending on which model you get, the Cherokee has either premium cloth seats or sleek leather seats. Whether you’re hauling equipment or your kids, you can raise or lower the seats to get 60/40 split middle and back-row seating for ease of access and extra storage space. Use the configuration you need for any situation. With heated seats, a heated steering wheel, and remote start capabilities, you never have to worry about driving in the cold or waiting for the car to warm up. The Cherokee also has many available conveniences, including a collapsible storage container, a cooler, a first-aid kit, a pet kennel, and a roadside assistance kit. With three available built-in navigation systems, you never have to worry about getting lost or being disconnected. There’s an available sunroof, an available memory system, and a premium audio system. It also comes with two USB ports, auxiliary ports, and 12-volt charging capabilities. Travel in comfort and style with the 2018 Jeep Cherokee. The RAV4 also has heated seats to keep you warm on those cold drives. With fully integrated navigation, you never have to worry about getting lost or bored. There’s also an available 120V power outlet to charge or utilize equipment that can make camping easier and more convenient. There’s an available foot-activated tailgate to make loading the trunk a breeze, and the 60/40 split rows give you all the storage you might need. The RAV4 is also capable of connecting to your garage, front gates, or security gate to make coming home even easier. Plus, enjoy the views with the available sunroof. Whether you’re in the forest, in the mountains, or by the beach, the 2018 Jeep Cherokee will have your back. With powerful engines, outstanding towing capabilities, and increased fuel capacities, the 2018 Jeep Cherokee can get you where you need to go, whether it’s on the road or the trails. In addition to its strong performance, it has a stylish and aerodynamic exterior that will turn heads wherever you go. And, even when you’re out in the middle of nowhere, you don’t want to sacrifice comfort. The 2018 Jeep Cherokee has you covered. With comfortable, heated seats, you can take just about anything on the ride with you, given all of the vehicle’s storage ability. Plus, you never have to worry about caught in a situation unprepared with the car’s available add-ons, including a first-aid kit. If you want a car that you can take anywhere without a worry, head on out to your local Jeep dealer today and test drive a 2018 Jeep Cherokee. Jeep Cherokee or Jeep Grand Cherokee: Which One is Right for Me?